Bloggers4UKIP: Why not ban the burkha? Why not ban the burkha? So far there have been two opinions represented here on Bloggers4UKIP on the proposed ban on wearing the burkha in public - outright opposition to the policy and a more balanced view. I'll offer the alternative opinion - support for the ban. Let's start by putting this into perspective. The burkha is not in the Koran. It is no more a genuine religious tradition than gospel singers or gay vicars. It's obvious why - if you were going to rob a bank or a petrol station, a bike helmet with a blacked out or reflective visor is an excellent disguise. So why is it wrong to see one of these? It is believed that one of the key suspects for the 7/7 terrorist attack (a man) in London escaped the country wearing a burkha. In Afghanistan and Iraq, our troops are putting their lives on the line every time the encounter a burkha wearer - is it a suicide bomber or not? But not just in Afghanistan and Iraq: on the streets of our own cities you will find many people covered head to toe in a burkha - the perfect disguise for a suicide bomber. Like it or not, since the IRA stopped bombing the mainland, the only terrorist attacks or attempted terrorist attacks we have experienced have been down to muslims. But it's not just the security risk, it's the social aspect as well. It is essential that immigrants and the children of immigrants integrate with society rather than setting themselves aside from the rest of us by refusing to speak the language, refusing to associate with the "natives" and by covering themselves from head to toe. All of these send out a very clear message - I am different, I am off limits. If most people in this country don't want to see the burkha being worn on our streets then why should we have to see it? It's not a genuine religious garment, there is nothing in the Koran to say that women have to wear it. It is simply a lifestyle choice and not a matter of religious freedom. It is not unreasonable to expect followers of an alien religion and culture to make an effort to integrate into society. The burkha is a barrier to integration, it is anti-social and a security risk and if a majority of people in this country want it banned then who are we to say that is unacceptable? Lord Pearson and Nigel Farage are responding to legitimate concerns about the burkha and the wider issue of Islamisation, something no other mainstream party will do. Voters no longer have to choose the BNP if they want a party that will deal with immigration, overbearing political correctness and multiculturalism. I am sure the burkha ban would be preceded by a referendum under the Swiss-style referenda policy that Lord Pearson announced as a key manifesto pledge and that it would actually be voters who decided with a UKIP government putting the case for the ban. At the end of the day it's down to whether you think a minority of religious fanatics should be able to segregate themselves in public because of a fake tradition or whether the wishes of the majority are more important. I think if it was rephrased to 'proscribing the hiding of the face in certain circumstances' then surely no one could possibly complain; as it would apply to everyone equally. I'm sure some would complain. One point I intended to make and forgot to do in the 24 hours it's taken me, on and off, to write this is that a few weeks ago someone was instructed to remove a face mask at an EDL march. He asked the policeman why he had to when a muslim could cover their face with a burkha and was told to just do as he was told. The Pants bomber concealed his bomb in his underwhere, so if we're going to ban the burka for security reasons, underwhere, and all other clothing should also be banned. Why not ban discrimination against lesbians instead? Sure, let's make them take it off in a bank or a petrol station. Why do you need a blanket ban? Have any bank robbers or petrol station robbers taken off their disguises in response to those signs? I used to ride a motor bike and never took my helmet off in response to a sign - if they had a problem I'd take my custom elsewhere. Let people cover their faces if they want to - the elephant man never did anyone any harm. Freedom Theory UK posts on how the government instructed the MSM and other bodies to discriminate against white British citizens. BTW, very balanced post, wonko. Why ban the burkha if people choose to wear it? I've no opposition to it being removed for security purposes and in places where hoodies etc are currently expected to be removed. This does not amount to an outright ban though. Just because the majority of people don't like it (personally I don't either), is no excuse for it to be banned in its entirety. Could you advise (other than obscuring identity and therefore possibly hindering identification for security purposes) what harm the wearing of the burkha is doing to you? UKIP should not attack the failings of the previous government by imposing 'a tooth for a tooth' policy. The failings of previous governments should be rectified instead. I agree with every word you say wonkotsane. I have kept out of the debate on this forum because I thought the party had been taken over by lilly livered liberals. But at last we have some common sense being spoken on the subject. The burka is a sign that women belong to the man, like a dog or a cow. A posession to do with as he pleases, and divorce when ever he chooses. It is a sign of forced marriages, and honour killings if the girl disagrees with her parents. In one country a woman complained to the police about a future forced marriage. The police said only the man of the house can make a complaint of this type. The girl said but he is the one forcing me into the marriage. The police replied yes, he is the one that must make the complaint, otherwise we can do nothing about it at all. We live in a beautiful free country where women are treated totally equal to men, in life and in law. The burka is a sign that women are inferior, and nothing more than slaves. The burka has no place in a free democratic country like Britain. Steve you don't stop oppression by attacking symbols - that just hides it. You stop oppression by stopping oppression (primarily by education). "It is not unreasonable to expect followers of an alien religion and culture to make an effort to integrate into society. The burkha is a barrier to integration, it is anti-social and a security risk and if a majority of people in this country want it banned then who are we to say that is unacceptable?" Everyone seems to be forgetting that this country is not a Muslim country. This country opens its arms, and financial benefits, to people of all religions and backgrounds, and that isnt going to change! UKIP's policy on immigration is going to take more control of it though, which is something the current government is incapable of doing. But why stop at just taking control of the number of immigrants entering the country, a government that finally takes control of immigration should also be making current and future immigrants realise that this country welcomes them to integrate, not just come here, reap our benefits and segregate them selves from the rest of us. The burkha is not in the Koran, it is a culture from other lands. . . . not our land! Sharia law will be next, simple message. . . not on our land! Call to prayer loud speakers from mosques. . . its not part of our way of life! If we went to a muslim land, we would not be aloud to impose our way of life and get away with it, in fact some places would make a british woman cover her face! And we would respect that! Integrate into the country you have come to! Is the simple message we should be saying, something the current government is incapable of taking a stance on! If the first move to making this clear is to ban a segregating symbol, then so be it! Steve Halden has posted some crap in his time but his comments about Muslim women and the wearing of the Burka are straight out of the fantasy world he inhabits. No Steve the party has been taken over by a Leader who is clearly anti Islam, and Muslim women, as his crass statements repeatedly indicate. The UKIP I joined was Libertarian, inclusive, no prejudice, non racist, no sexist, non homophobic, at least that's how you and others sold it to me. Clearly the vast majority of the members still value those qualities, it's a shame when it comes to Immigration/Islam the Leadership are forcing us to mirror the BNP more and more daily. Most of the objections I’ve seen to UKIP’s proposed ban aren’t to do with security issues. The same face-on-display requirements should be applied to everyone. The issue is down to whether or not it’s acceptable to ban burqas in all public places, which is what UKIP are suggesting. It smacks of authoritarianism not libertarianism. Even if the majority in the UK support a ban on the burqa, which I don’t believe is the case, I’d still be opposed to the idea. It equates to mob rule. The majority of voters don’t vote UKIP, but I can’t imagine many UKIP supporters (including me) would be happy if someone tried to ban the party because it only represents a minority viewpoint. Also, the Qur’an may well be the primary source of guidance for Muslims, but the hadith play a major role too. Even though most clerics don’t consider obscuring the face mandatory, many do accept that there are sufficient references in the hadith to support women covering their faces voluntarily. Whether it’s solely a cultural lifestyle choice and nothing to do with Islam is highly debateable. Not that it makes any difference as to whether burqas should be permitted in the UK or not. As far as integration goes, much as I believe that immigrants to the UK should learn English, and much as I would happily see a ban on schoolgirls covering their faces, how people live the rest of their lives is their business. None of the posters on here,save one, have their photo up next to their name (most don't even provide that), but it doesn’t make them anti-social, and it’s not stopped anyone having their say and expressing their opinions. Of all the religions, Islam is the only one whose leaders do not wish their followers to integrate into our society, and Sharia, which can alas be described as gender apartheid, holds growing sway in too many parts of our country. So the burka is a symbol of separation, discrimination and fear. Its a hot topic, it wasnt so long ago that Jack Straw approached the subject, but in true fashion of the supposed three main parties, took it no further. UKIP are only continuing their stance as a party that is going to get on with things! Instead of hint at things and take it no further! Well said! I appreaciate the very good sense you are talking, in you latest post about the burka. At last we are getting some sensible comments on this forum. Sensible comments, comments borne out of prejudice and ignorance more like. UKIP's policy is not Public Buildings, at least that's not what Farage and Pearson said, it was 'Public Places'. I guess Mr Halden the master UKIPer didn't hear that bit. This policy is divisive, prejudice and completely unnecessary when Muslim women and their religious leaders all say the removal of the veil in specific defined situations would be honoured. I wonder if Mr Halden would like to campaign in the Broad Green area of Swindon and express those views, I doubt it he thinks campaigning in the town centre during lunch time on a Saturday, in Swindon town with a large immigrant population would put him at risk. Letter from Lord Pearson published in the times. "Your leading article (Jan 16) warned that our proposed ban on wearing the burka in public buildings"
"UKIP's proposed policy on banning the burka in public buildings and public places . . ."
Is it any wonder that this policy is getting ripped apart, there is no policy it is 'off the hoof'. Asked what would be the penalty for not complying he had no idea how to respond so the presenter guided him through, leading right into saying ultimately it could lead to prison. I repeat the Muslim Council of Britain and all other Muslim commentators do not have a problem with the veil being removed for security to reasons, or to comply with 'private' property owners rights, ie shops, pubs etc (although would they go to pubs anyway). So we cannot continue to muddy the waters. put up a post saying how this ban proved UKIP illiberal. Neil, how censored he clearly operates a moderated blog, as I do. He probably hasn't seen it yet. "If most people in this country don't want to see the burkha being worn on our streets then why should we have to see it? " So you believe in majoritarianism? Illiberal democracy? Government regulation of our choice in clothes sounds like what I'd expect ZanuLabour/BluLabour to be advocating. Ignoring the wishes of the majority is why we're still in the European Empire. The burkha is a security risk and a barrier to integration. If you can legislate to force people to wear certain clothes (or clothes in general, it being illegal to walk around naked) then why not legislate to stop people wearing certain clothes? Using your logic Wonko then you don't mind paying out all these green taxes etc for AGW. Seeing as the majority still believe in it ! UKIP has just ended it's slim chances at the GE with this policy. The majority don't believe in AGW and I imagine even less will once the media stop suppressing the news that the UN is investigating its own global warming scam artists. You are living in a fantasy world wonko. More than 50% of people do believe and using your argument that is good enough to make it right. Banning anything ( especially items of clothing) is fascist, end of . Any political party that claims to be freedom, democracy and libertarian and the bans clothes on WHATEVER grounds is just plain lying. Based on security issues UKIP would also ban trainers and pants on airplanes I guess. Wait... people actually take this burkha thing seriously? Guys, it's stupid. Certainly put me off voting UKIP anyway. I think it will put a lot of existing politicians off defecting to UKIP. Is policy setting exclusively down to the leader? Just wondering if this was an ill judged 'off the cuff' thing that went wrong? Interestingly in the new piece I have published the bizarre logic of the Brit's comes through loud and clear. The majority want to see the Burqa banned in certain public places but another clear majority think it's wrong for Government to tell people what to wear. You couldn't make it up. You are right the burkha isn't in the Koran. The same as the cassock, mitre, wimple, habit, dog collar aren't in the bible. Shall we ban those too? By the way, all this screeching about Islam not being British ( true) It has escaped peoples attention that nor is Christianity. Another middle eastern, Abrahamic, suppression religion. The actual indigenous ethnic religion of the British Isles is Pagan ( Asatru). Banning items of clothing for any reason is dictatorship. Requiring someone to identify themselves for security reasons is a completely different issue. There is already in place a method for dealing with identifying women who choose to cover their face in airport/customs security areas. lets put it as brutal as we can shal we. . . . Lets see if you change your mind on the matter when the next bomb goes off, killing one of your loved ones. . . and someone responsible for organising the plot flees the country again in a burka unchallenged! The difference is someone cant hide their face behind a dog collar or a piece of christian jewelery, try walk through an airport with a balaclava on and you will be challenged, . . . If you mean Yassin Omar, Anonymous, he also made use of National Express coaches and a red Nissan Sunny in his bid to escape. Should we ban those too? Its not about being in a car or on a bus. . . . its about the covering of the face! Hiding of identity. 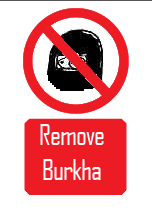 Its the anti 'Ban the Burka' people that are making this topic ridiculous, not the idea of the ban in the first place! Its and intended move to assist in making this a safer country! Im assuming you will be one of the people that likes the idea of handing over cash this country doesnt have to terrorists to practically ask them to stop coming over here to blow them selves and our innocent people up? Its these terrorists that are using their traditions, ie the Burka, as a weapon. Our soldiers are being killed by women (or even men) suicide bombers that are approaching in full Burka, we cant ban it over there! But we have that option over here! You’d be assuming wrong then. People hide their identity all the time “Anonymous”, and as has already been pointed out, repeatedly, they can do it in countless ways without resorting to covering their face with any type of veil. What’s your proposal? Shall we just ban anyone from altering their appearance? Stop them from pulling their scarves over their faces in winter? Ban hoodies, crash helmets, beards, wigs, hair dye, make up? Stop anyone from carrying luggage anywhere? Wrap everyone up in safety bubbles instead of clothing? You might want to live in a police state, but I don’t. You’ve far more chance of being killed in a car crash or all manner of other ways than you have of being blown up by a suicide bomber. If it is *necessary* for someone to be identified then clearly they need to be detained until their identity is established. 2a) Some people don't like seeing people 'ostentatiously' displaying membership of a different culture. 2b) Some people feel they don't like seeing/meeting people without being able to see their face. 1) An Iris scan could be done even with the face covered, but a check against a passport photo would require the face to be shown. 2a) It doesn't bother me personally, but it is up to the people of this country to make a decision -- but then it should really apply to all 'alien' cultures (so much for chinese new year with men disguised as dragons). 2b) If someone is in a public role (teacher, police officer etc) then unnecessary (i.e. not for safety etc) face covering seems bad for communication. If someone is just in the street, again it doesnt' bother me, but it is for the people to decide. I would agree with what your saying POP, The only point id change is what you say about chinese new year. That and other events like it are a festival, lasting a short period of time for celebration. The Burka is worn permanent, all year round, shopping, commuting, etc. The Burka hasnt been brought across here for celebration, or to mark anniversary events. Its a symbol of segregation, an un-equal imposition on women, and unfortunately, its from a background that has extremists, that are happy to hide behind it while expressing their hatred for this country! 1) Banning a slave owner from chaining his slaves, doesn't make the slaves any more free - they just look it. So instead of banning the burkha ensure muslim women are educated, have self confidence and self respect so they can freely make their own choices (this applies to all british citizens, not just muslim women). 2) What about Stamford Hill ( http://www.guardian.co.uk/commentisfree/2008/jun/15/religion.communities ) they are hardly integrated... Are they 'OK' as long as they don't take up too much of 'our' land? or as long as they stay totally isolated from 'us' (out of sight out of mind)? FWIW: I think 2 is the *real* issue but people are too scared to be honest (or even think about it) because they are still too cowed by the marxist political correctness witch hunts. Until people are honest, there will be no real answers.